Happy July!!! Can’t believe half the year has already flown by! 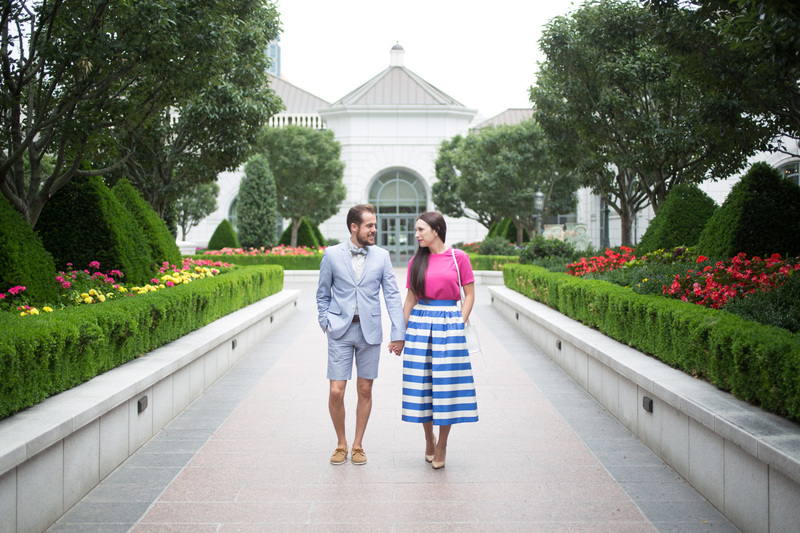 We took these pictures outside at gorgeous The Grand America Hotel gardens. The courtyard is located right in the middle of the hotel. They had just recently planted all the new flowers for the season and they were so beautiful and smelled amazing! Anytime we go to Tea Time at The Grand I always request to sit by the window so I can see all the beautiful flowers. When we stayed at The Grand we knew we would want to take some photos in the gardens/courtyard and we are so glad we did! The flowers are too pretty! There are also some beautiful fountains too! The Grand is having a fun summer vacation deal you can check out here. 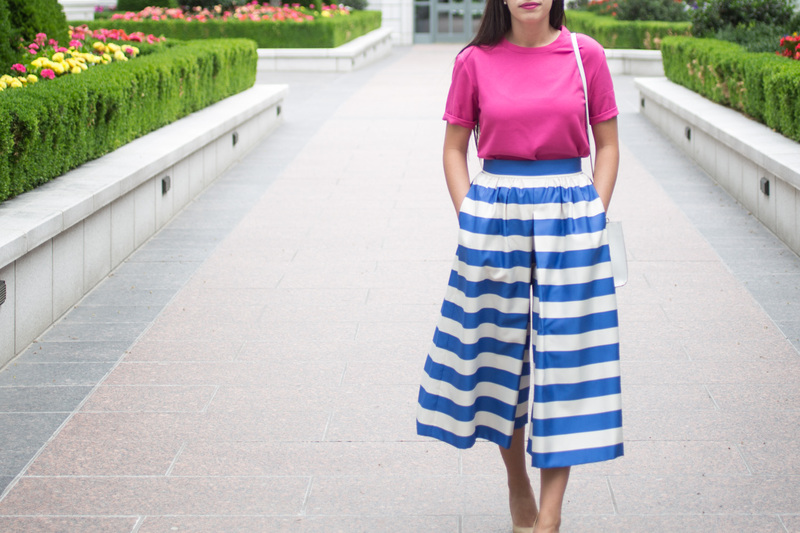 I recently got these fun stripe culottes from Alice and Oliva! I loved that they looked like a skirt with a nice pleat but really are pants! They are so comfy and fun! I have been trying not to wear them too much because I want to wear them all the time! I think I may have to bust them out again for the 4th of July this weekend! Jake is wearing a short suit he got for our Disneyland Trip awhile back. 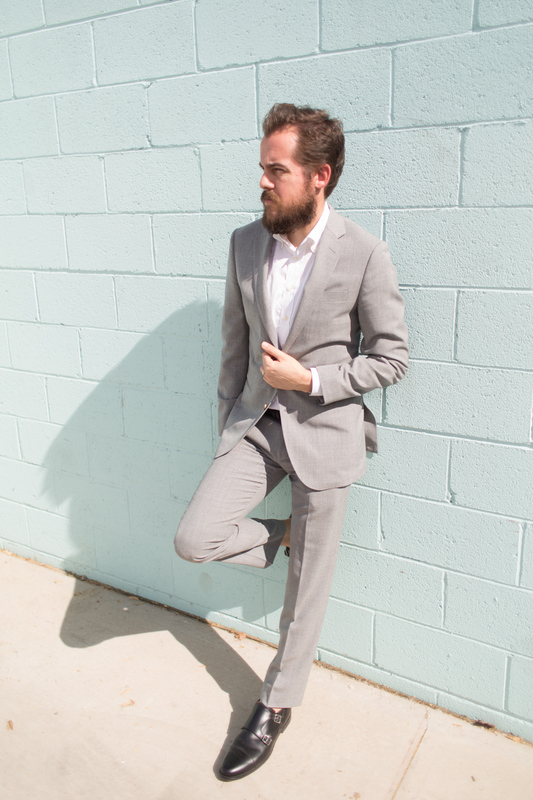 Its been the perfect summer suit with its neutral chambray color. 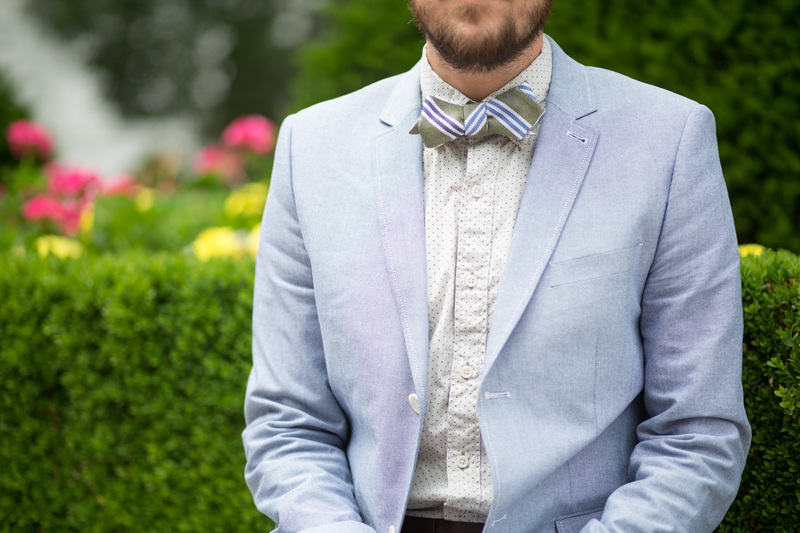 It is easy to pair lots of different ties/shirts/shoes with. 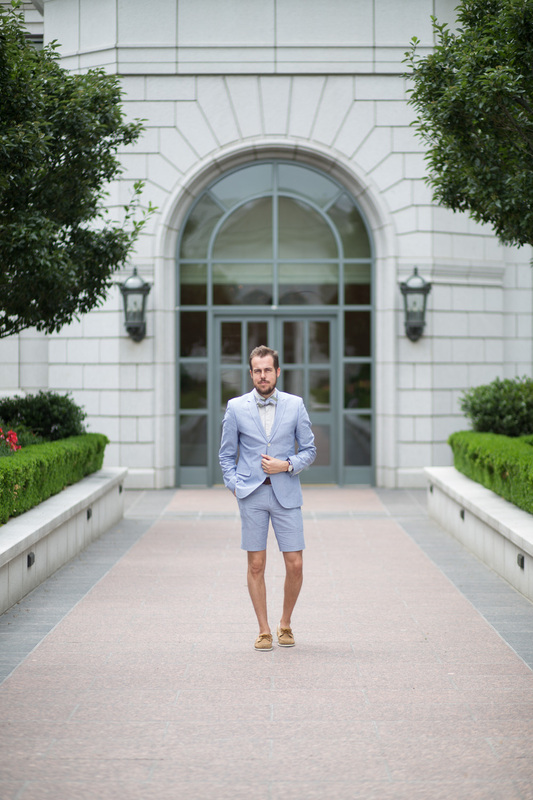 Jake didn’t realize how much he would love having a short suit set and he is hoping to stock up on some more later this summer! Thanks for stopping by today! Hope you have a lovely week! You both look gorgeous! Love your skirt! Always perfection. Great post and thanks for sharing buddy! 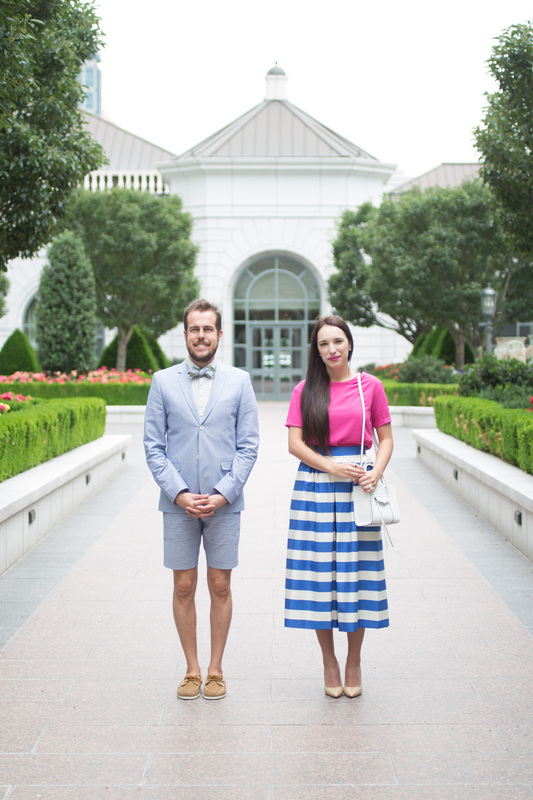 I love everything about this post – the pictures and the outfits! So beautiful! I can't get over how cute you guys are! I also can't believe those are culottes! It looks like a skirt! Pink plus blue stripes is such a great colour combination! Love the neutral heels too. 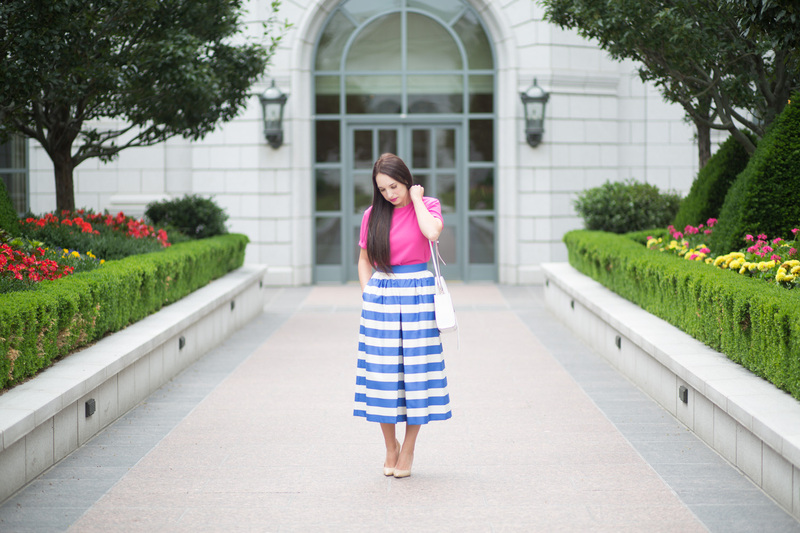 Those bold striped culottes are killer, lady! Love 'em on you! Those culottes look like a midi skirt! Love the stripes & color combination on you!! love this!! so beautiful! please stop by for my latest post! I love it when culottes masquerade as skirts, and this pair does an amazing job of that. Classically chic guys! Love it! This might be my most favorite Kelsey Bang post ever! You both look so dashing, and I need those Culottes in my life immediately! Those outfits and that setting make you two look like the perfect million dollar power couple! Great outfits!